Of all the "Exorcist" sequels, I've only seen the Boorman film, and even though I was only 17 at the time, I knew it was a mess. The only thing I remember from it now is that sequence where Linda Blair is tap-dancing in the school musical while at the same time Richard Burton is getting stoned (as in being hit with stones, not sucking on a doobie) in some desert country I can't recall. And then for some strange reason, Linda starts wincing in pain in the middle of the tap dance as if she can feel the stones that are hitting Burton. I always thought that scene would work better if Richard Burton started tap-dancing in Afghanistan or wherever the hell he was. This post definitely makes me want to see Exorcist III. They absolutely should have made Richard Burton tapdance. He'd windmill his arms around and be all "Whoa!!" and then all the natives would applaud at the end. I don't know how they could have missed that idea. It was staring them right in the face. And yes, you should absolutely see EXORCIST III. Hugely underrated in my opinion, although it has developed a pretty healthy cult following over the years. I have to compliment you on a really compelling look at this series of films. Although I can't agree with your appraisal of Schrader's movie, which was fittingly described on another film-site as "Culturally insensitive, xenophobic, pretentious and worst of all shoddily made", I do agree 100% with your assessment of Blatty's Exorcist III. I remember seeing the first part of it on video as a kid and having to turn it off at the moment where the unseen person in the confessional starts talking about cutting off heads in the most disturbing voice I'd ever heard. Later I saw the whole thing on TV and found it utterly mesmerising. As you say here, "a terrific film, strange and funny and genuinely frightening"
I finally caught Boorman's Exorcist II a couple of years ago and was hoping to discover a lost masterpiece in need of reassessment; however, it was as dreadful as I'd been led to believe. Not quite the "so bad it's good" experience that some people like to claim; just a lumbering, pompous and generally very boring film. 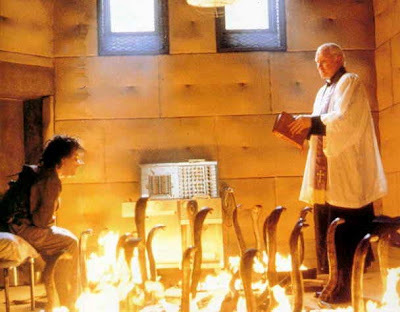 Someone recently did a fan recut of EXORCIST III, LEGION, to hew it closer to Blatty's intent, removing Nichol Williamson, who was added, along with other footage to make it 'more like an EXORCIST film'. Which is the thorn in all of the sides of the various sequels... Boorman's film has some good ideas and visuals - the main problem with the film is that, as an 'EXORCIST film', it's completely ridiculous. Take that onus off of it, and (at least for me) it's a fairly interesting ride. The ideas of the original film unfortunately get lost in all of the shock value and special effects and it seems that very few can get past that. Lights - Thank you, sir. And yes, there is much that is genuinely chilling in EXORCIST III, more *actually* disturbing than just about anything in the vast majority of horror films that have followed. Culturally insensitive and xenophobic towards whom? The British? 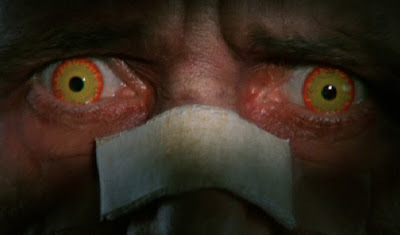 L. Rob - That's the interesting thing about Blatty's intentions for EXORCIST III, aka LEGION -- as you know, there would have been no exorcism at all, so it would have been like no other horror sequel I can think of. I really doubt that the footage is actually lost forever, but I also doubt anyone is digging very hard. I would love to see the film Blatty wanted to make. Even so, he took the reigns and added what the studio wanted himself, and I think he did a good job. The enforced ending isn't actually bad, thank God, and is, in my opinion, pretty good. Just not what it should have been. ALso, by the way, I think that's really a testament to what a strange and terrific cast Blatty put together. When the studio demanded a certain change, and a new character to make things more accessible and commercial, who does Blatty cast? Nicol Williamson! That's awesome! I'm with you on The Exorcist III. It's not a great film, or even consistently competent, but it is genuinely goddamn scary--as any horror film should be--and just so weird and mesmerizing. Whatever Blatty's strengths and weaknesses as a director, he picked up on and appropriated one of the under-appreciated aspects of Friedkin's film, which was all the strange details and unnerving asides--what I call the "creepshow factor"--which are just as effective as the all the notorious head-spinning and vomit. There's some really effective production design going on Blatty's film that sticks with me to this day: little choices in sound design, lighting, costume, set decoration. The whole movie has a undeniably off-kilter aura that provides a wonderful, acidic contrast with its Catholic seriousness. Also: "Gracious me! Was I raving?"